Poems are written for us to read, appreciate, and to understand. The book Red Book of Poems is one of the book series of the book Poems by Seth Godric. Everyone can read words and phrases but not all can appreciate and understand the true meaning and message of a poem. 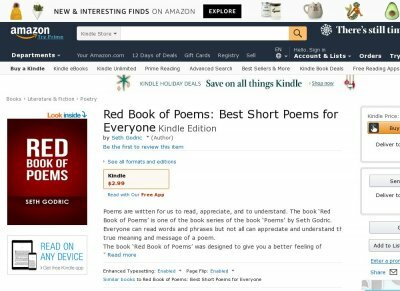 The book Red Book of Poems was designed to give you a better feeling of appreciation of art and beauty of poetry. It will motivate and inspire you to embrace the true meaning of life. The 101 collection of poems presented in this book covers love, friendship, happiness, loneliness, dealing with loss and abandonment, and many more. Some of the poems will make you glad and joyful, others may bring gloom or mixed emotions too. The poetry inside this book will remind you to become more humane in nature. To understand the true essence and taste of life the bitter and the sweet. Enjoy and may this book bring you satisfaction while sipping your favorite hot cup of coffee or green tea.